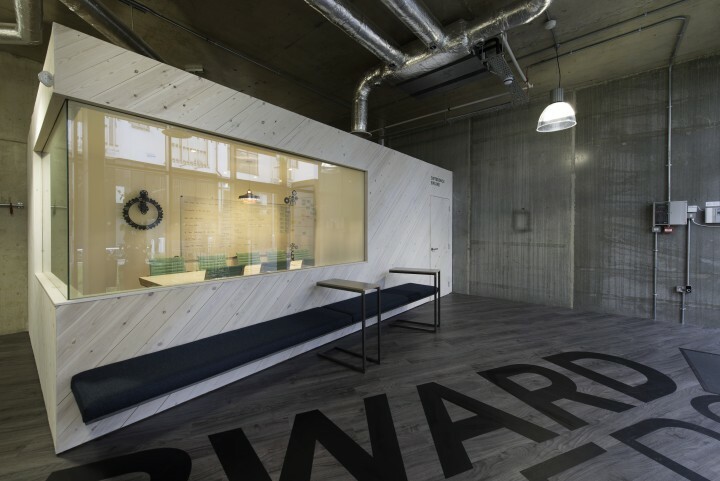 ﻿ Forward Partners Office | not tom. 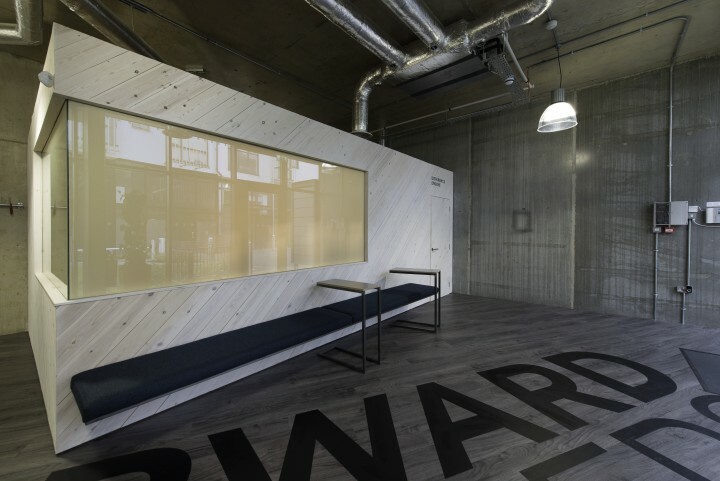 Forward Partners are an investment agency and incubator for e-commerce start-ups. 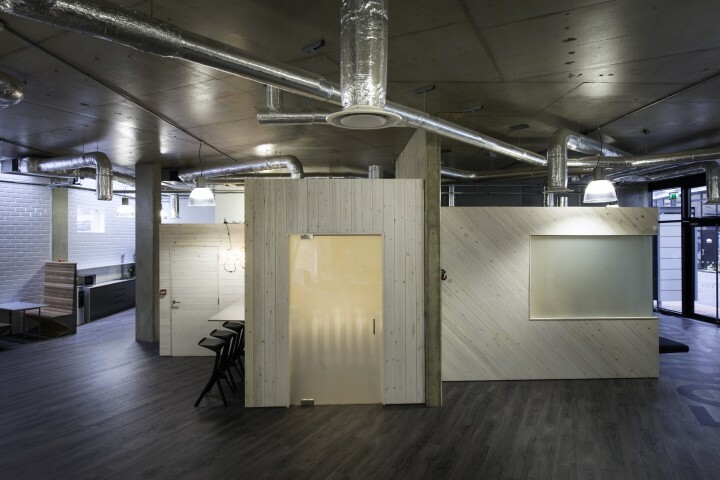 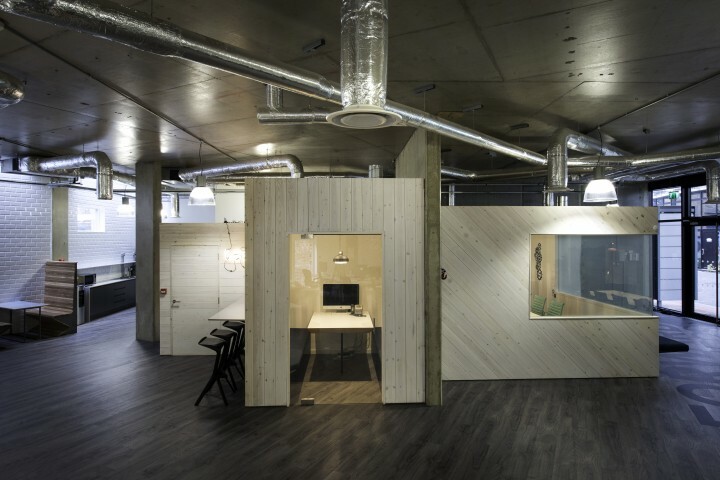 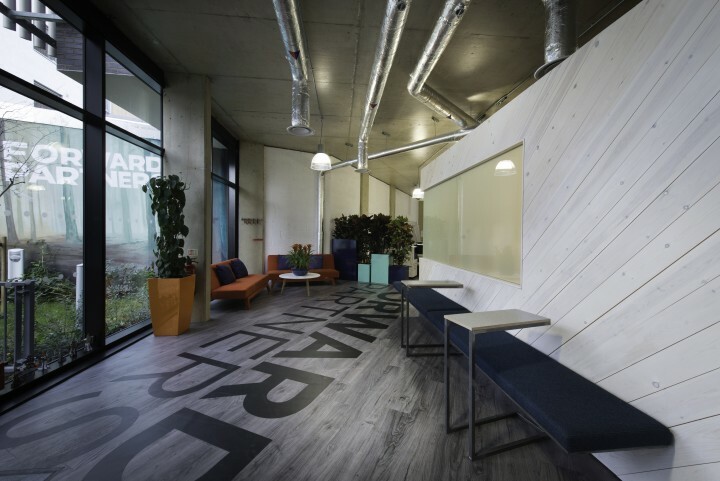 They recently moved out of their offices in Camden and into a brand new space in Shoreditch and required a complete fit-out of a large, empty,industrial looking space. 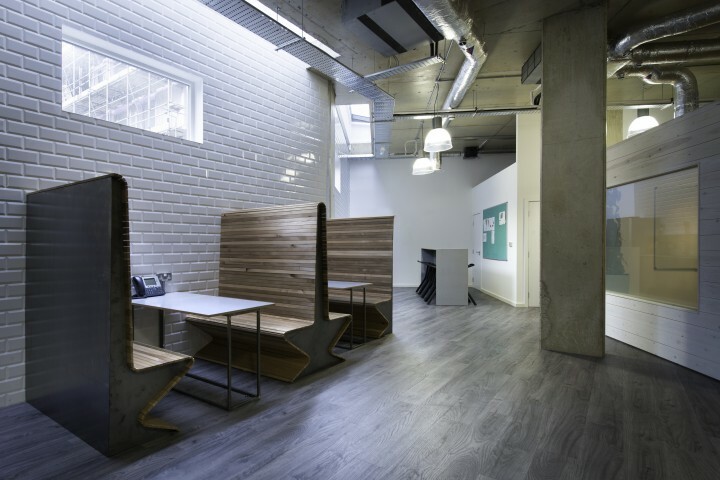 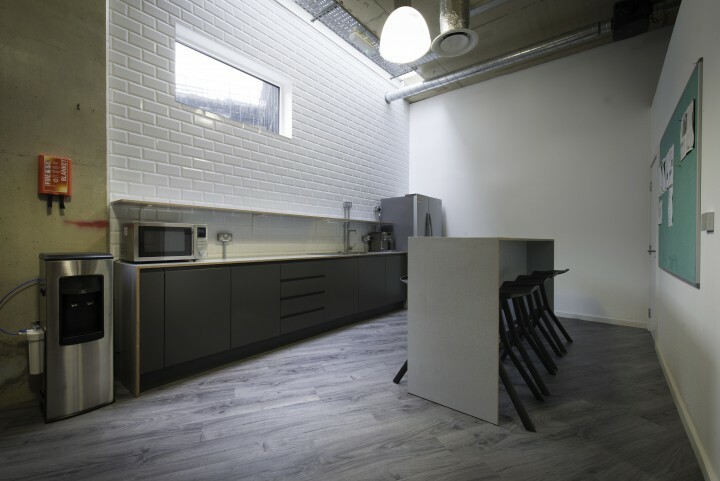 All aspects of the office were designed and bespoke made by us, with the exception of the desks, which were brought from their previous office space and integrated into the scheme. 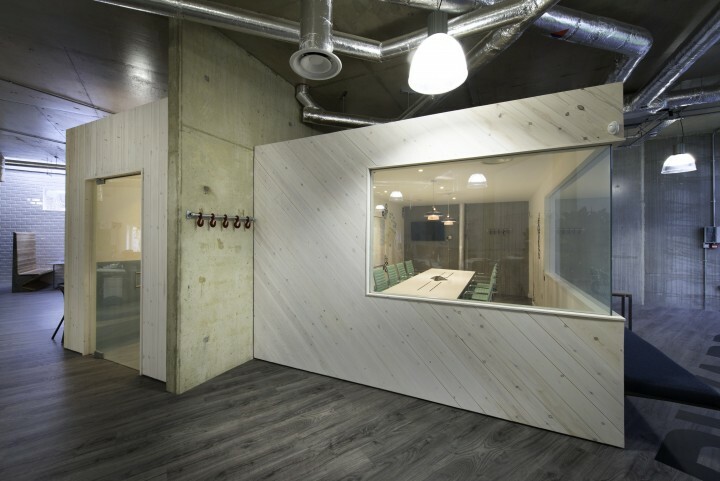 We built three meeting room spaces, all clad in beautiful, UK grown, Douglas Fir timber. 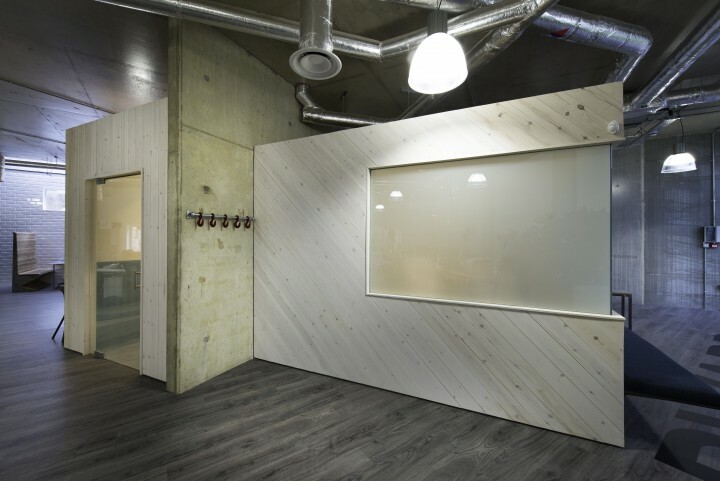 These were finished in a subtle graduated white stain to add individuality and flow to the design. 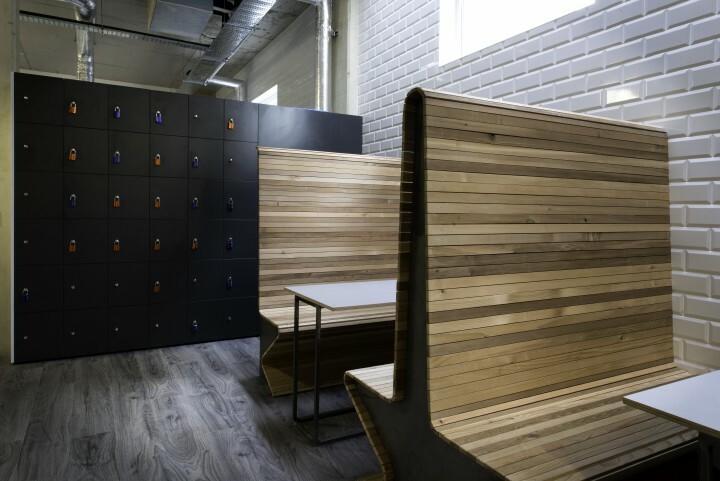 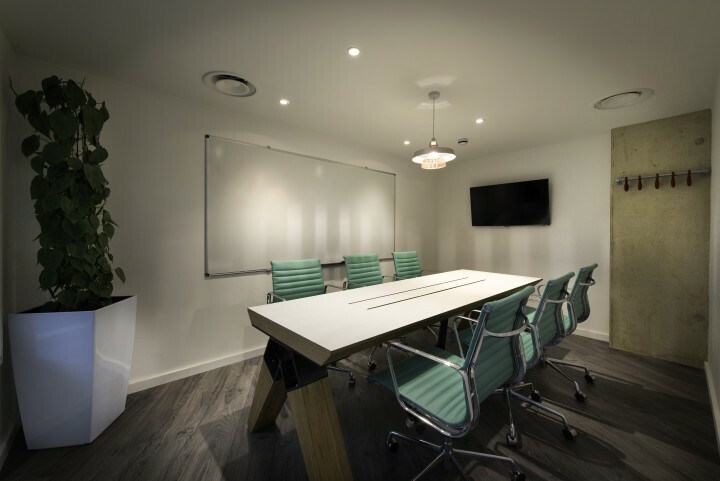 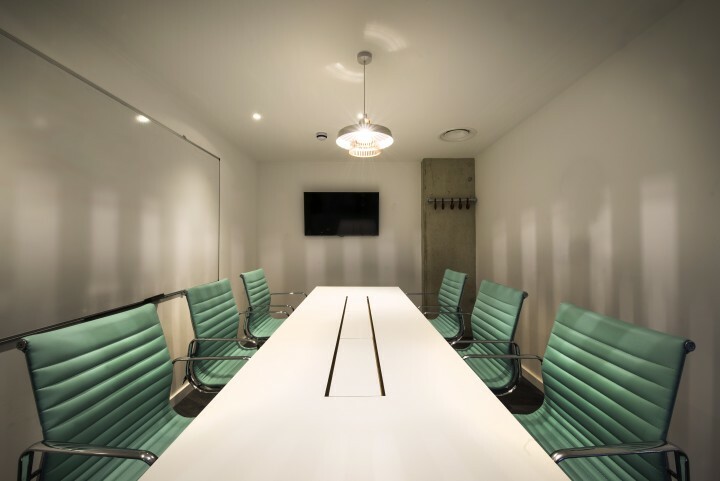 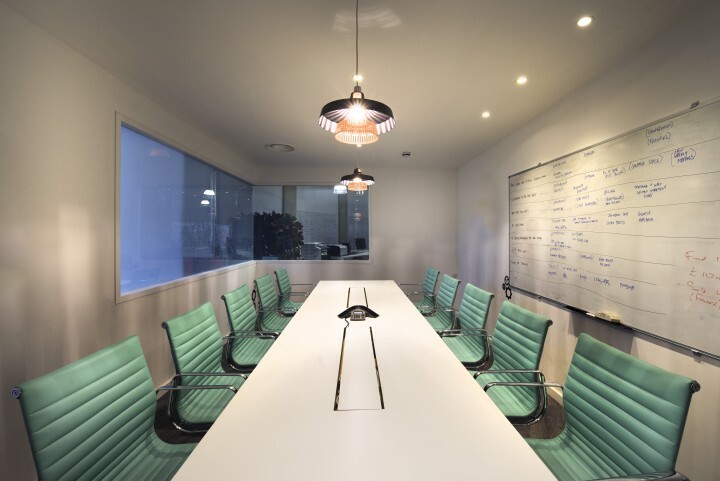 Part of the brief for the office was that an open, friendly and sociable feel should to be achieved, in line with FP company culture but it was also vital that some spaces had the ability to be made private for important meetings. 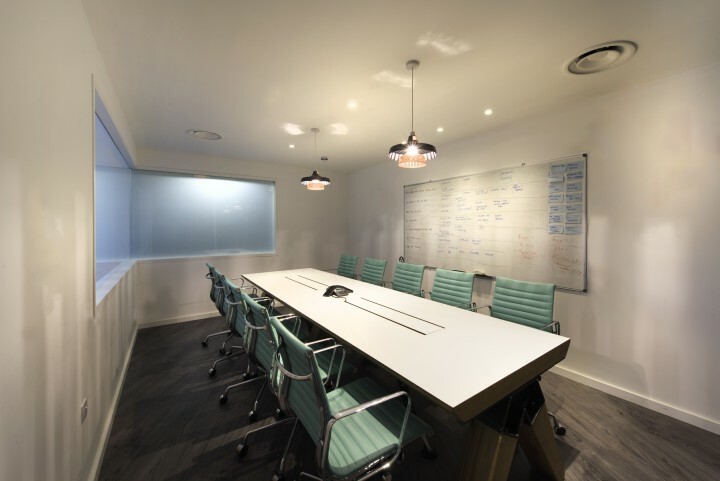 With this in mind we incorporated switching glass in the meeting rooms, allowing glass panes to change from transparent to opaque with the flick of a switch. 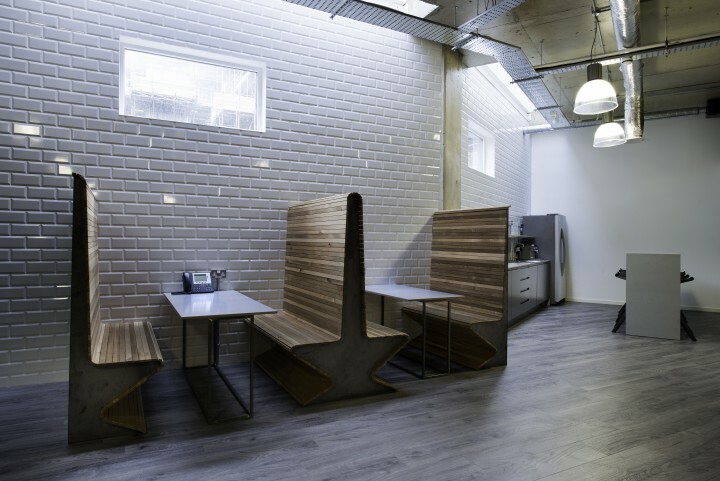 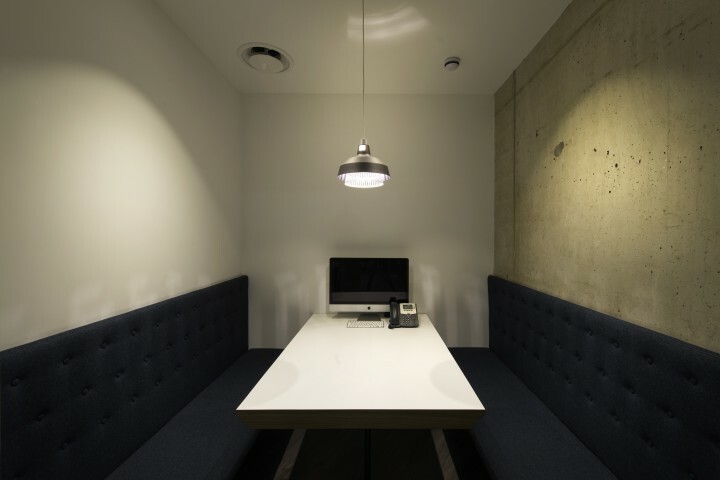 Wool upholstered benches form break-out areas and perch desks between meeting rooms create plenty of places for workers to chill, chat and meet informally. 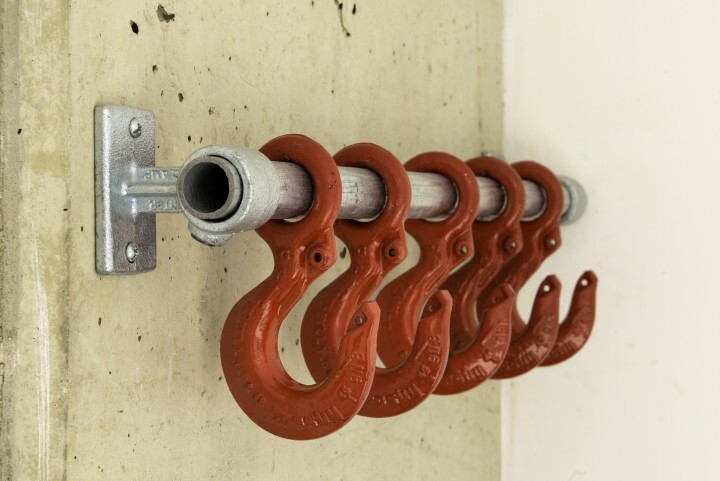 Coat racks made from big, glossy red, industrial lifting hooks add hits of colour and contrast nicely with pale concrete surfaces. 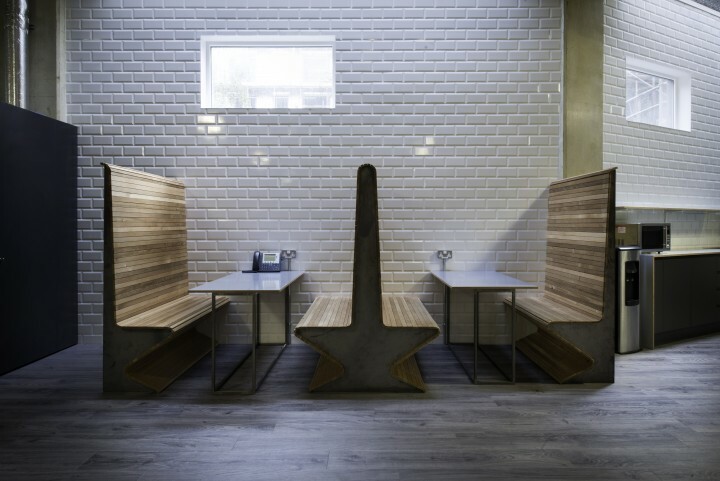 For a more open and relaxed seating area we designed elegant Cedar clad benches with raw, uncoated mild steel edging. 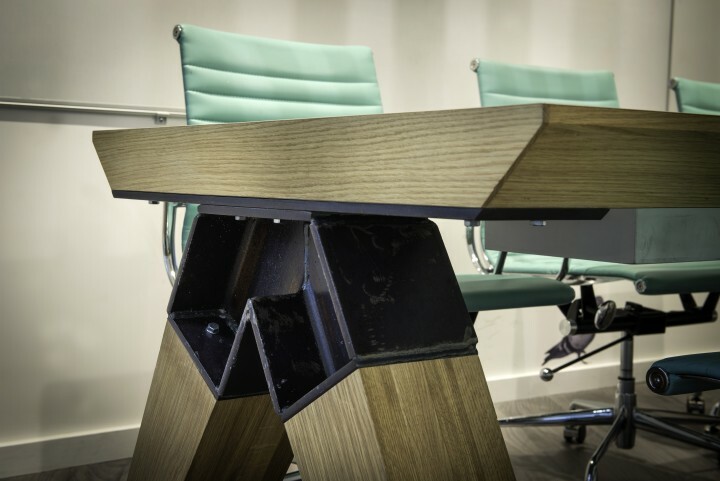 The uncoated steel will patinate over time, allowing the furniture to grow and change alongside it’s users.